The Red Wattlebird (Anthochaera carunculata) is the largest honeyeater on the Australian mainland. The only larger honeyeater is the Yellow Wattlebird (Anthochaera paradoxa), which is found in Tasmania. The wattles in question do not refer to the trees in which these birds live but rather the fleshy appendages that hang off the side of the head. The scientific name is derived from the Greek words anthos meaning flower and khairo meaning to enjoy and caruncula meaning little bits of flesh – referring to the wattles. Wattlebirds are mainly nectar-feeders, aggressively defending territories of flowering plants, but also eat insects and honeydew. Their loud cough-like call gives them the alternative name of Barkingbird. 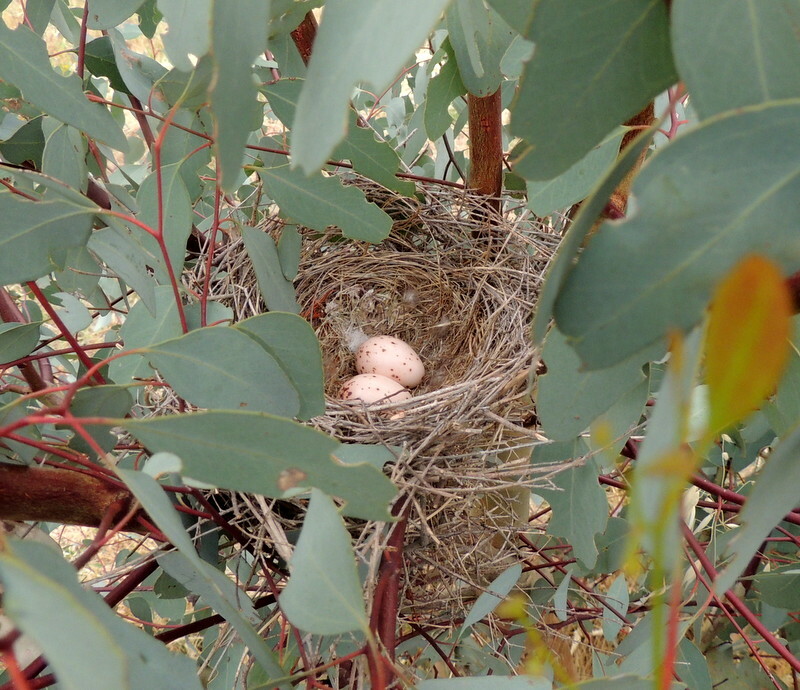 In my concerted quest to locate nests this season I was lucky enough to come across a nest in a two-metre high Red Gum (Eucalyptus camaldulensis) sapling. The nest contained two brown-spotted pink eggs (pictured left), with no adult in sight. A later viewing of the nest (from a distance) revealed mum (or dad) sitting on the eggs (pictured right). This year there seem to be many Pied Currawongs (Strepera graculina) around. 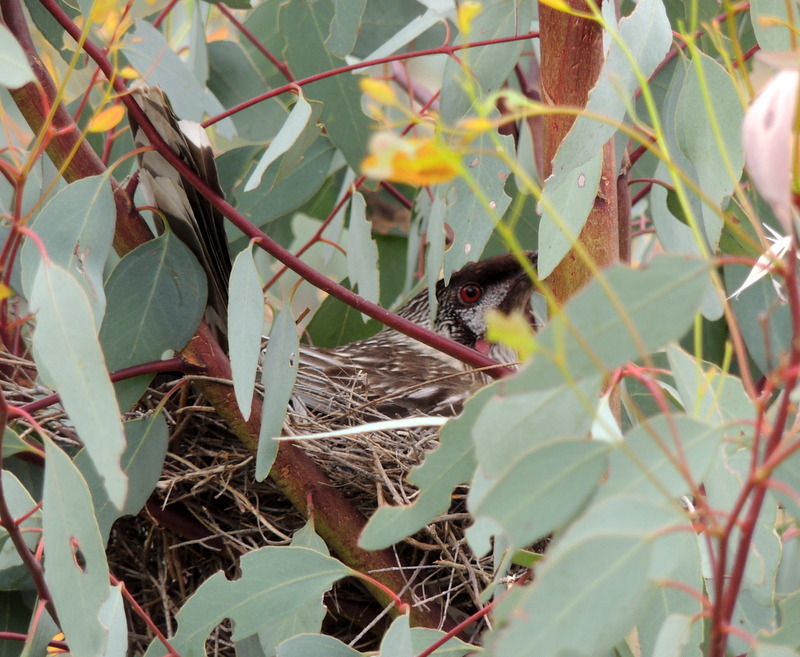 These birds are notorious nest robbers and with the honeyeater having such an exposed nest it will be interesting to see if the eggs or chicks survive. Both the Red Wattlebird and the Pied Currawong are aggressive birds. The ensuing battle will be like the irresistible force versus the immovable object.